The Vulturine Parrot or Vulture-headed Parrot (Gypopsitta vulturina) is endemic to Northeast Brazil, Southern Venezuela, south of Amazonia in eastern Pará and northwest Maranhão. This parrot is easily confused with the Pesquet's Parrot (Psittrichas fulgidus) - a Neotropical parrot that is endemic to humid forest and adjacent habitats in the eastern Amazon of Brazil. 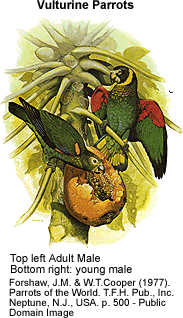 The Vulturine Parrot has a total length of ca. 23 - 24 cm (9.2 - 9.5 in). It has a rather short, squarish tail, and a mainly green plumage, which typically is tinged blue, especially below. The chest is olive-brown. The underwing coverts are bright red, and when perched this can be hinted as an orange-red shoulder-patch. The under-tail is yellowish with a bluish tip (appears dark against light). The outer webs and tips of the remiges (flight feathers - typically only visible in flight) are bluish-black, making the outer sections of the upperwing appear quite uniformly dark in flight. The arguably most conspicious feature, however, is its un-feathered blackish and orange-pinkish head, bordered by a broad yellow collar of feathers, followed by a second blackish collar. This bare, vaguely vulture-like head is the reason behind its common name. Juveniles have a feathered greenish head. Little is known about its behavior, but it is suspected the bare head is an adaption to avoid feather-matting from sticky fruits. It has also been recorded feeding on seeds and berries. Until recently, it was placed in the genus Pionopsitta, which now is restricted to the type species, P. pileata. Furthermore, individuals previously believed to be immature Vulturine Parrots were described as a new species, the Bald Parrot (Gypopsitta aurantiocephala), in 2002. Copyright: Wikipedia. Some of the above material is is licensed under the GNU Free Documentation License. It uses material from the Wikipedia.org.